If you give a lot of presentations on your computer the last thing you want to do is have to flip through slides using the arrow keys on the keyboard. Wouldn’t it be better the have something that can allow you to stand away from the computer and wirelessly switch through the presentation? The Presenter Expert by Kensington might just be the tool you are looking for. The Presenter Expert works like most presentation remotes I have tried. It has buttons for advancing and reversing the presentation (very responsive), a button to black out the screen for times you want to hide a slide, a laser pointer and a mouse mode to control the computer from a distance. Overall, these basic functions work great with the exception of the mouse mode, which is a little clunky. However, it does the job in a pinch, and I have never tried a remote with decent mouse controls. Personally, I really like the layout of the buttons on the remote. They are straight forward, and you don’t have to think about which buttons to press when using it. The buttons do what you would expect. I used a remote this past year and I was always pressing the wrong button because the buttons were not where I expected. Speaking of using the remote, the device is very comfortable in the hand. It is formed, almost like a mouse, to fit in your hand. To make the connection between the device and your computer you use a USB dongle. The great feature about this dongle, and what makes the remote stand out, is that the dongle is also a micro SD card reader. You can save your presentation to a micro SD card and take it with you. No need for your computer as long as you have access to one that can read you files. 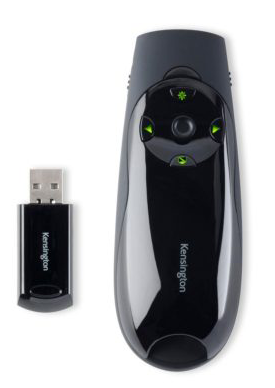 Better yet, Kensington provides a 4GB micro SD card with the remote to get you started. The range of the remote to the computer is 150 feet, according to Kensington. I found this to be pretty accurate in my testing. Set up is easy to0. Insert the included batteries, plug the dongle in, turn the remote on and go. No drivers needed on my iMac. In addition to the batteries and micro SD card the remote also comes with a neoprene case. A nice little extra. Overall, the Presenter Expert is a nice presentation remote that comes with everything you need. It is a little pricier than other remotes (especially for the green laser) that are out there, but you are getting more than just a basic presentation remote. If you are in the market for a presentation remote, I highly recommend looking at this one.